Swatches and Review: BB Couture For Nails - Anger, Uninvited, Sexual Space & Smoke. I hope your day is going well so far? 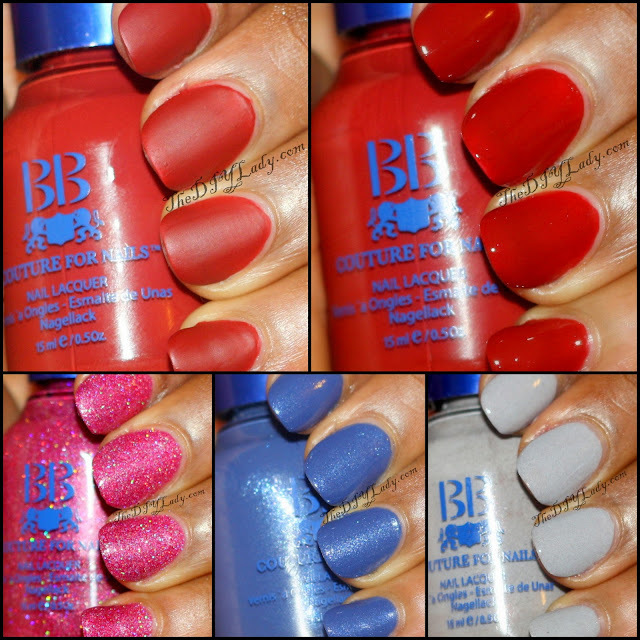 I have swatches of some BB Couture For Nails Polishes to show you guys today. I showed y'all Bottle Pictures In this POST and on MY FACEBOOK Page, and now you get to see how these polishes look on my nails. BB Couture is a relatively new brand to me, but I am already seeing myself picking up some more of their polishes! Can we say, AMAZING formula?! Here's a Collage for ya! And Now, Individual swatches and review! So that I don't repeat myself too much during this review, I'll mention right now, that all swatches are two coats with no Topcoat except where mentioned. Listen to this: Uninvited is a MATTE red polish! Pure velvety perfection in two easy, non streaky Coats! I love when Matte polishes apply like butter. This Polish certainly INVITED me to Fall in love with it. The Curious Lady in me however wanted to see what Uninvited looked like Shiny, So I applied one coat of Seche Vite over it. I am very happy to say I Love it both ways!!! Matte or Shiny, Uninvited is now one of my go-to red nail polishes. This is Gray. As gray as gray can get. I generally don't gravitate towards polishes like this, but this one is very welcomed in my stash because it's not a DULL gray. Last but Certainly NOT the least is Sexual Space. This one is my Absolute Favorite of all of these four polishes. Yes, If you know me, You'll know that I LOVE Holographic POW POW polishes! Sexual Space did not disappoint me! Look at all the multicolored sparkles in this one. It shines even in the dimmest lights and I just Love that I didn't have to use an underwear for it. I thought it would be sheer at first, but I went ahead to apply it on my nails alone, and I was pleasantly surprised that it got opaque in two coats. As I mentioned at the beginning of this post, I am very happy with the formula on these polishes. My two absolute favorites are Uninvited and Sexual Space. Both are just uniquely beautiful! If You're interested in either of these polishes or want to check out more polishes by BB Couture for Nails, Please Visit them on their Website, Facebook or Twitter. Products Provided for review. Opinions are 100% mine. Wow - sexual space is fantastic!! Right? ? That's what I said too! Thanks sugar. Anger looks great on you. That pink holo is amazing! Wowzer!!! Yes! ! I know you'll like it. . We share a love for glitter! ! I thought the pink one was the best, but the blue is pretty awesome as well! It has so much depth. Yes that blue is pretty too. Now that I think about it though. . It reminds me of another polish I can't quite put my finger On right now. . Thanks though.